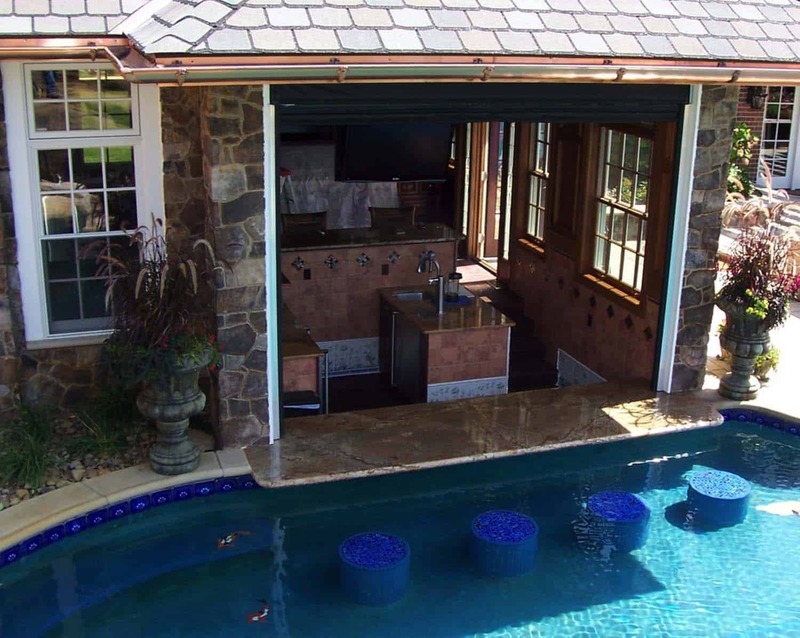 Swim-up pool bars are a hot trend in the pool design industry, not only do they look amazing, but they help you stay cool while you enjoy a cold beverage and a delicious meal. 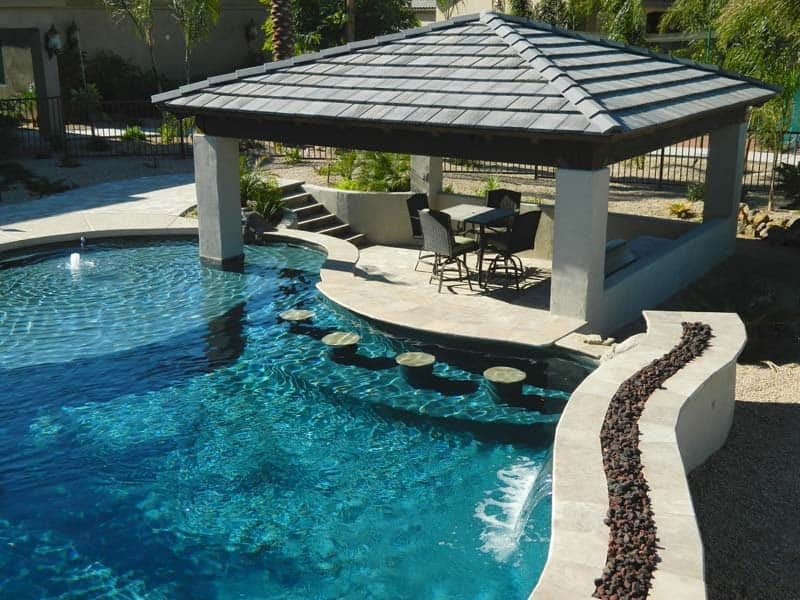 There are so many designs and we have featured a wide variety of these luxury amenities. 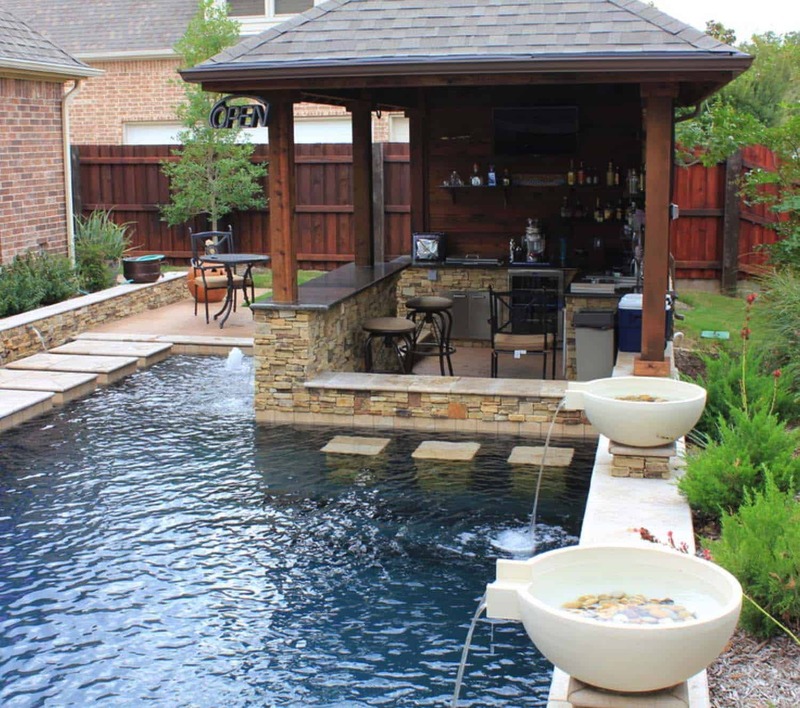 They provide the perfect spot to entertain your guests, all the while staying cool while you enjoy great conversation, snacks, barbecue and having a drink. 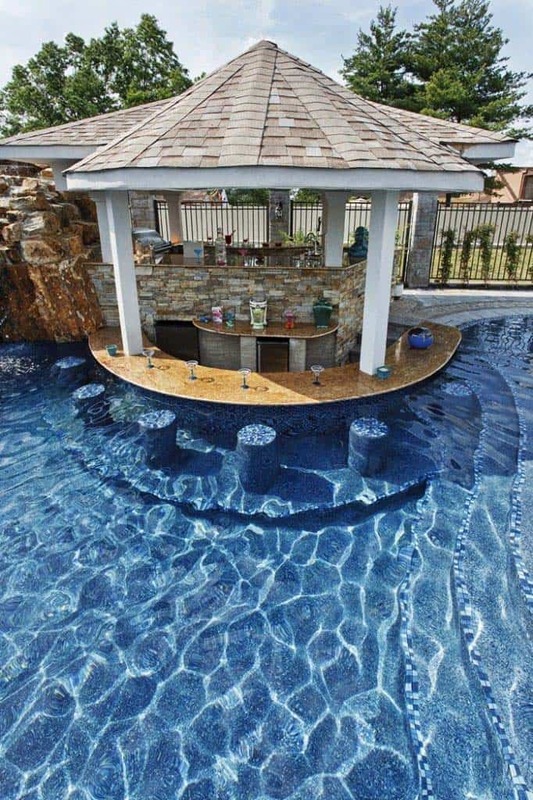 They are also a great perch to be enjoyed by your kids, fun for the whole family! 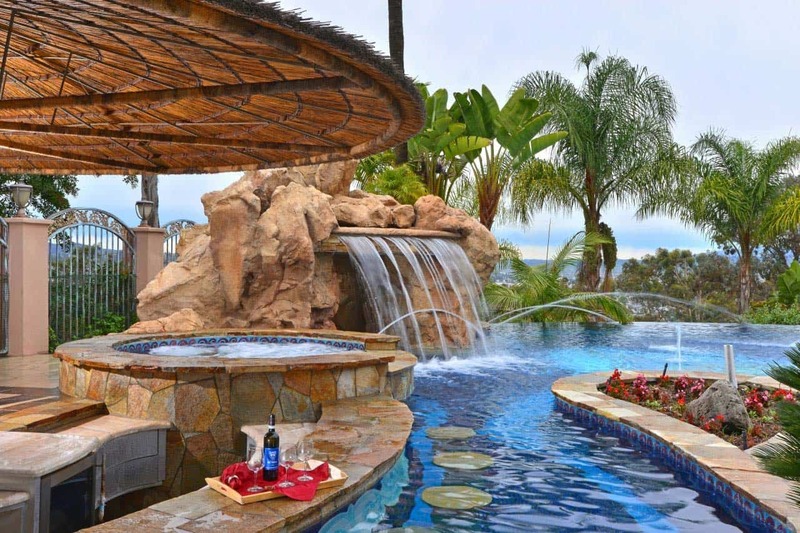 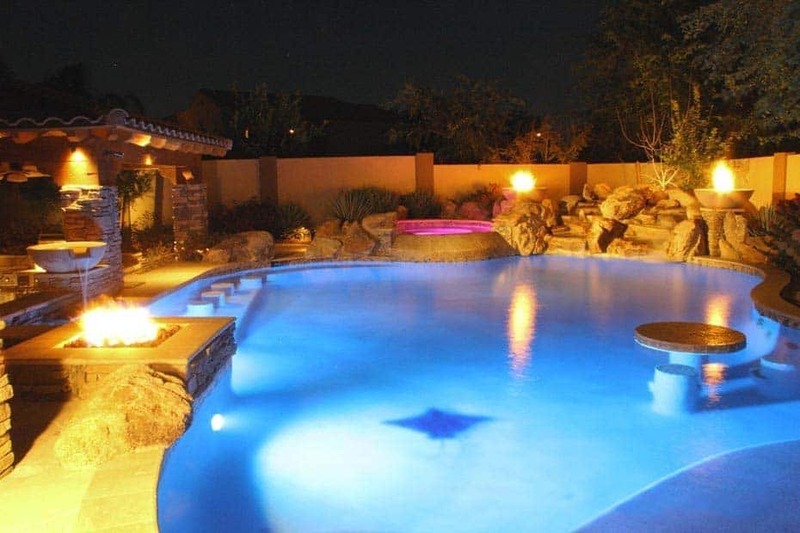 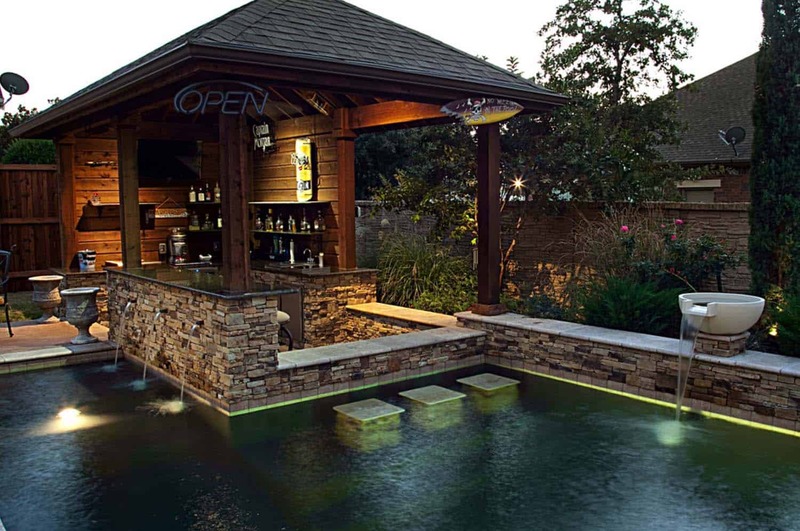 Below is a collection of amazing pool bars that we have gathered for you to get some inspiration to create your own backyard swimming pool oasis. 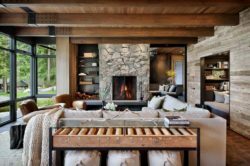 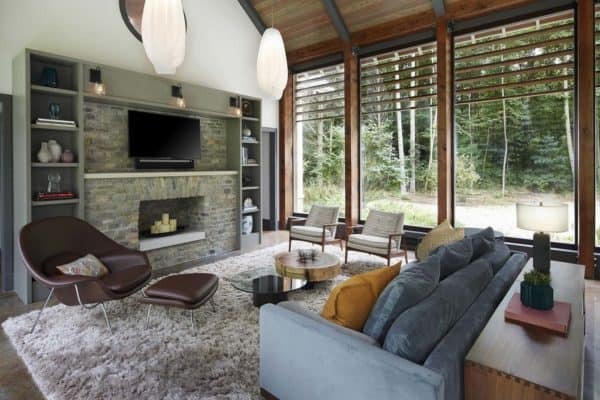 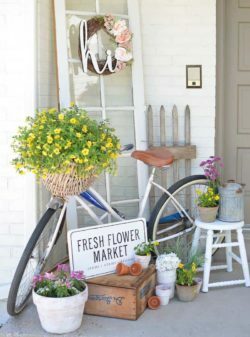 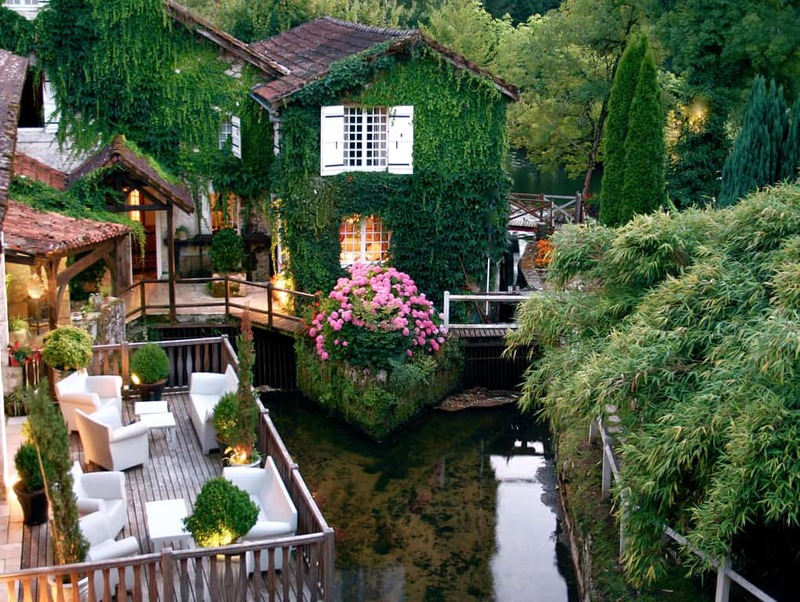 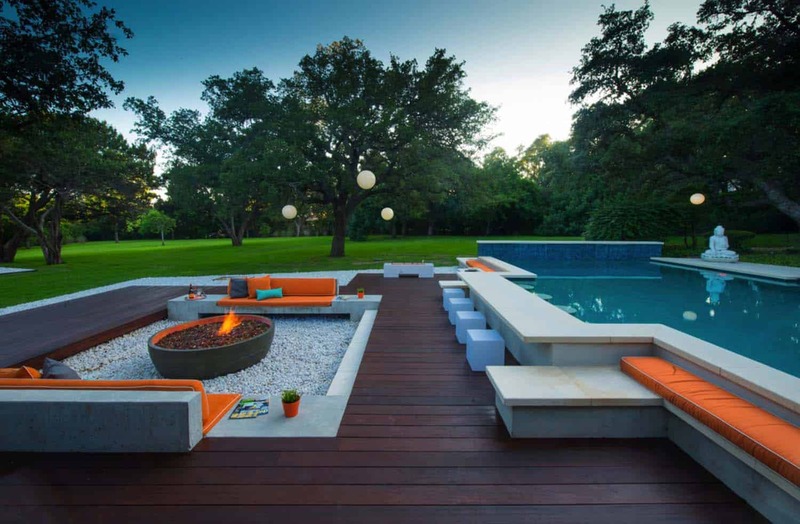 Which one of these amazing outdoor spaces is your favorite? 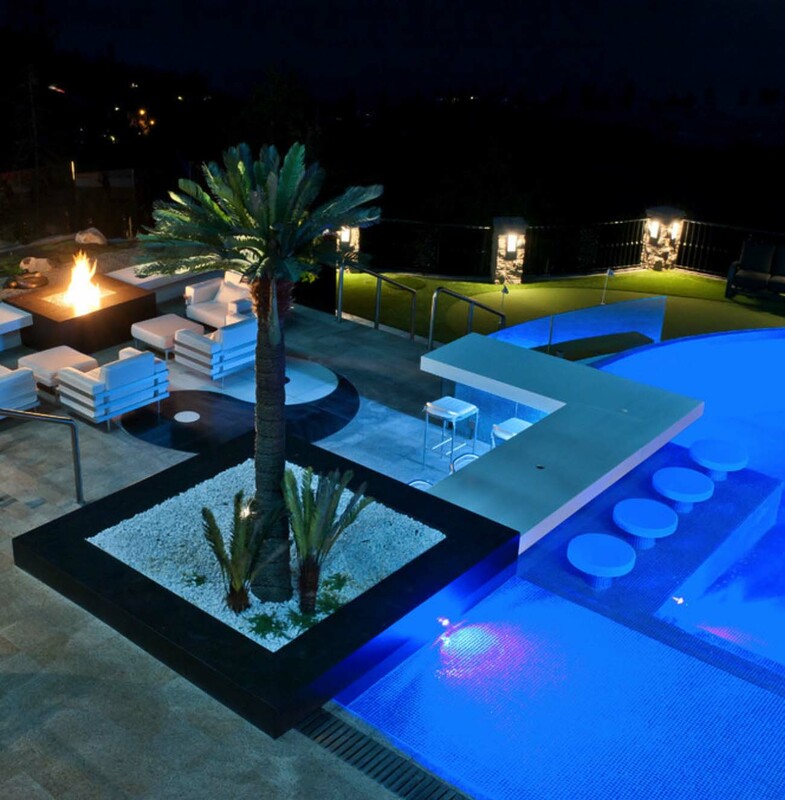 Above: This outdoor kitchen area is ultra-luxe, resembling a five-star hotel bar and pool lounge. 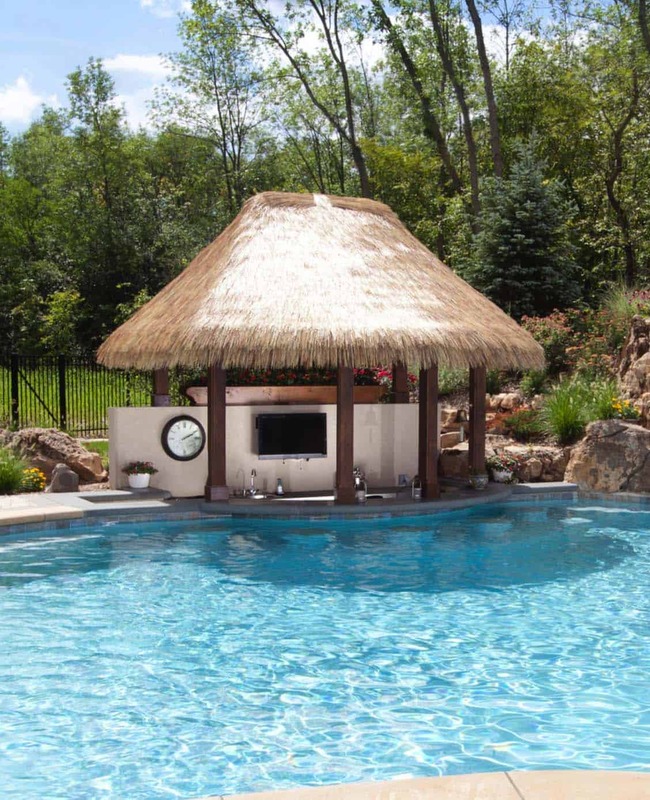 The outdoor kitchen is fully-loaded, with a pizza oven, a swim-up pool bar, a mounted patio heater and ceiling fans. 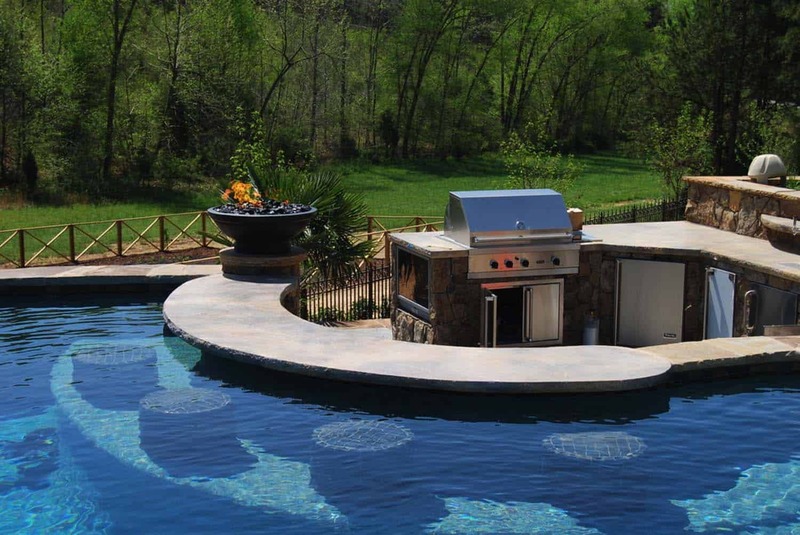 Its a full on kitchen including a grill… can you say dreamy? 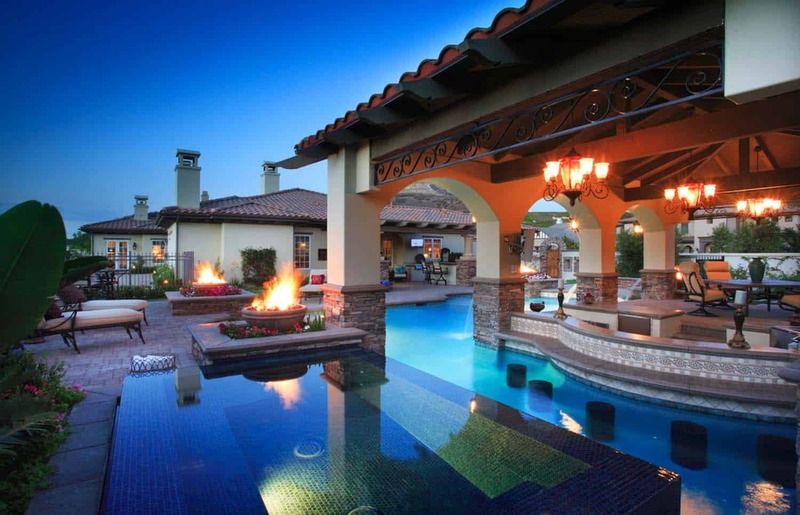 Above: This outdoor swimming oasis features a lounge area with a fireplace as an added bonus. 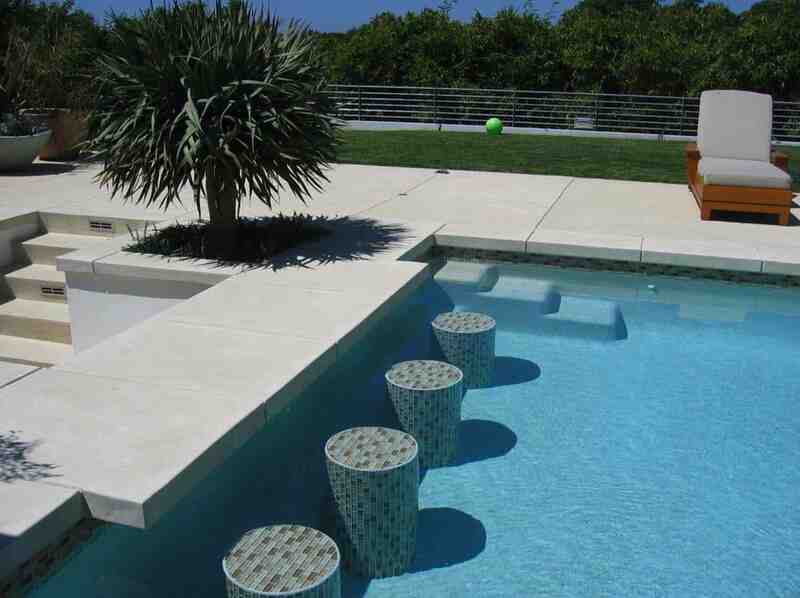 The patio surround is Lueders limestone. 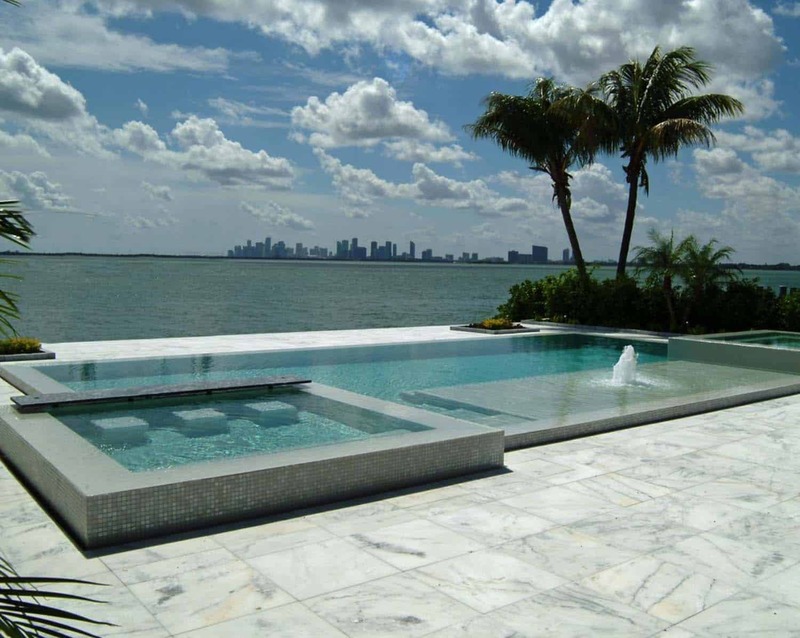 The swim-up bar is clad in an expansive slab of granite, with built-in seating for three. 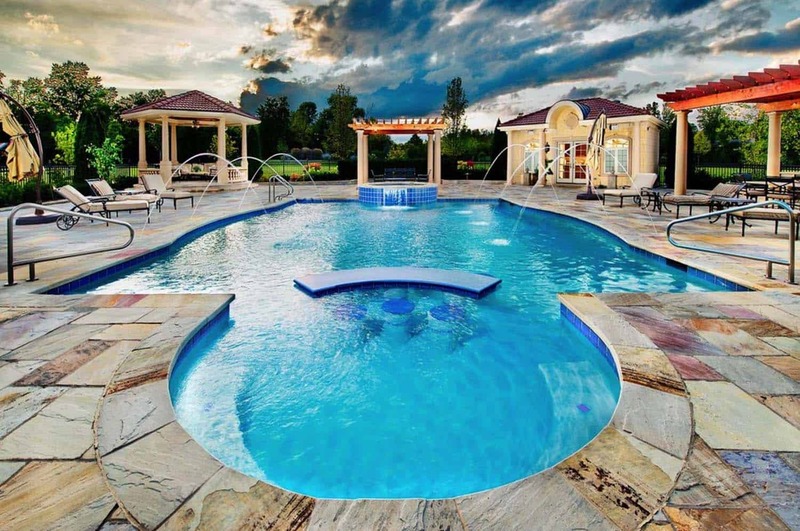 The chef can cook meals in the pool house and walk just a few steps to serve pool guests. 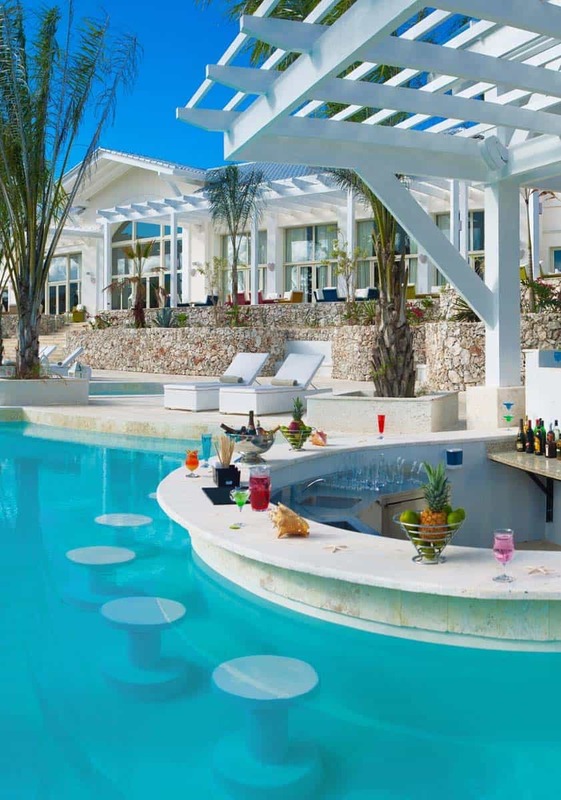 Above: Swim up to the bar and enjoy all that the outdoor barbecue has to offer! 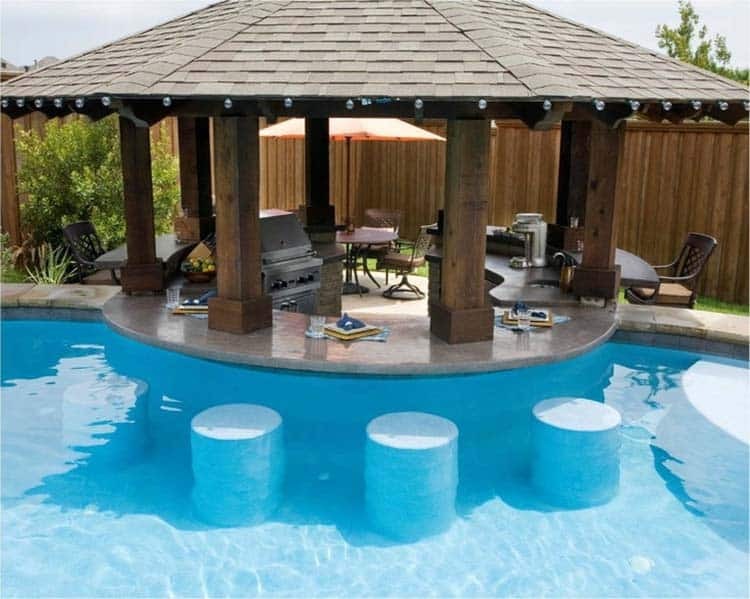 One can grill up a storm right in front of their guests while they stay cool in the pool. 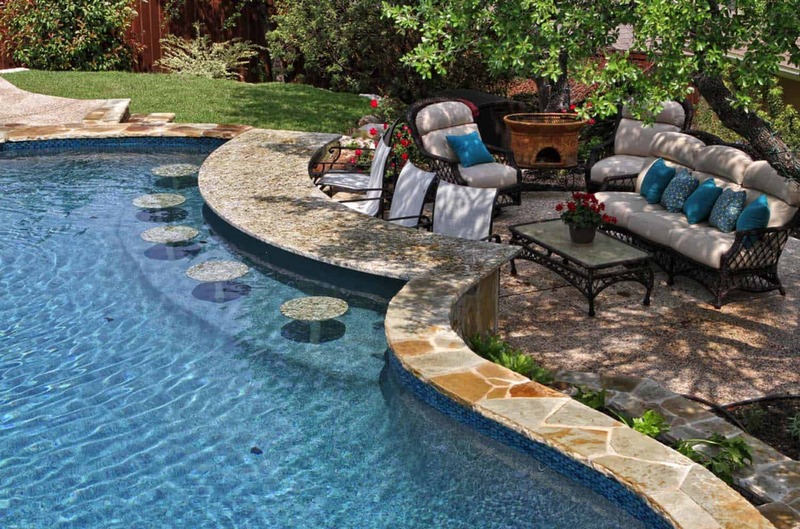 Above: This backyard oasis has every amenity one could dream of. 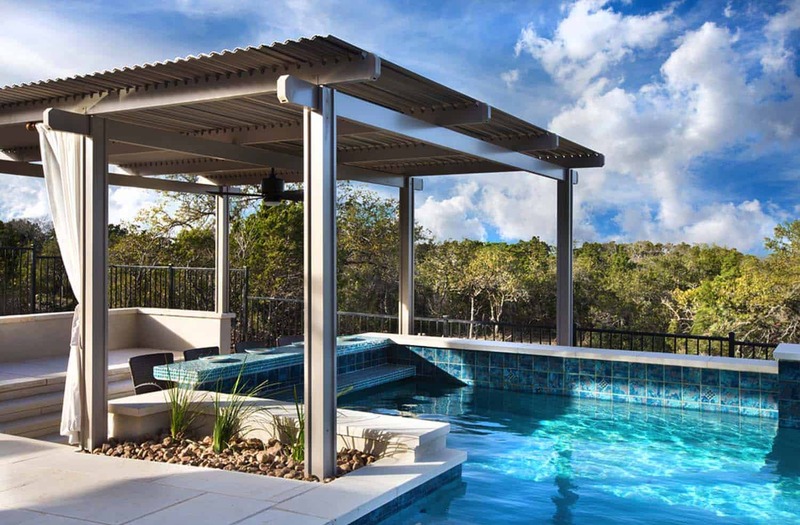 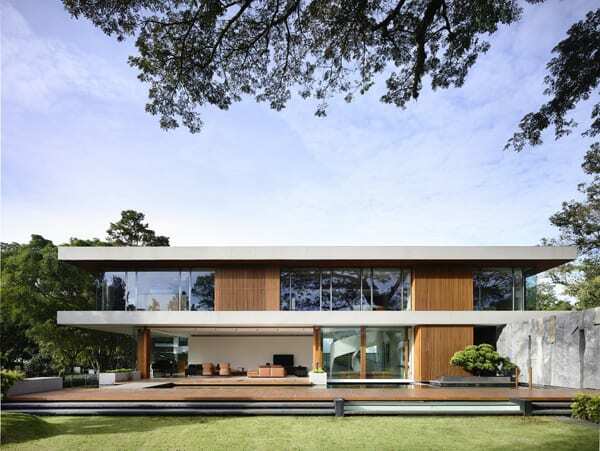 An expansive pavilion provides shade for dining al fresco. 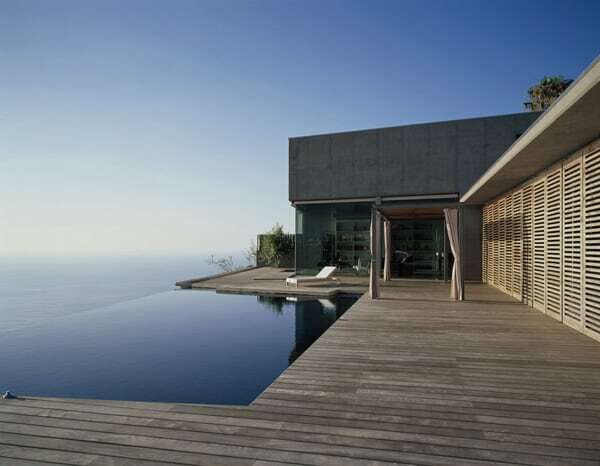 There is also a sunken outdoor kitchen, a bathroom and an over-sized spa. 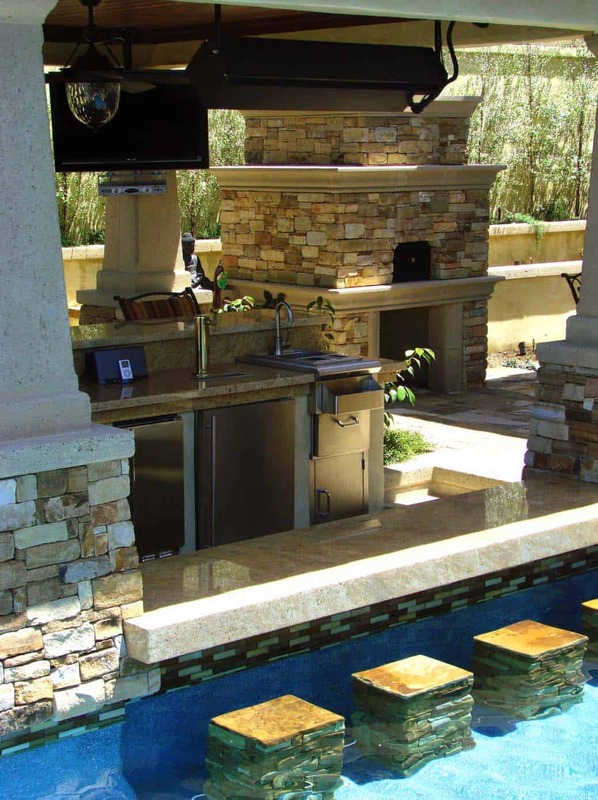 There is an all-weather television that swivels, so that it may be enjoyed by both diners or those in the pool/spa. 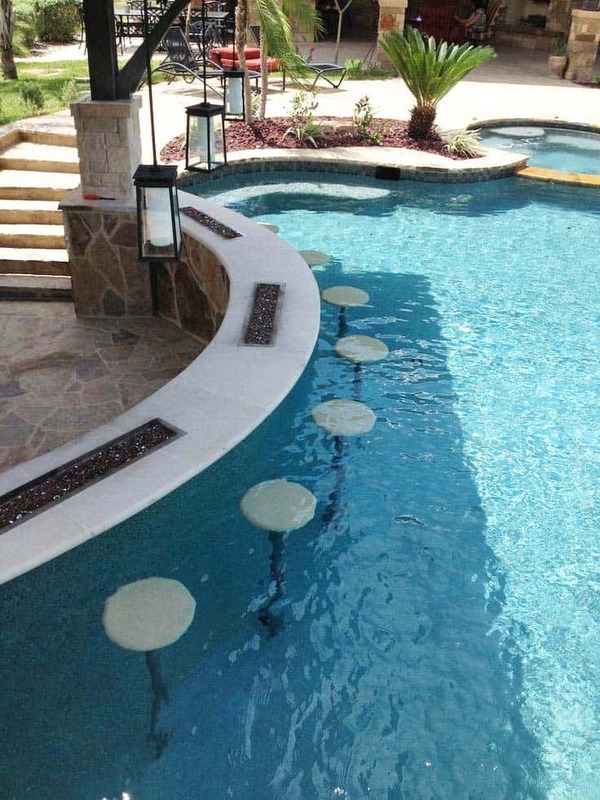 A swim-up bar also allows another option for guests to enjoy food and beverage. 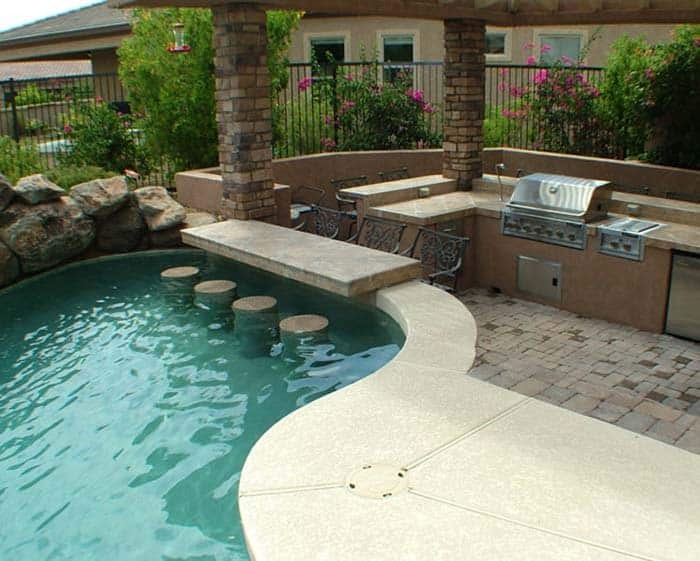 Closer to the house, there is an additional outdoor kitchen, television as well as an outdoor living room. 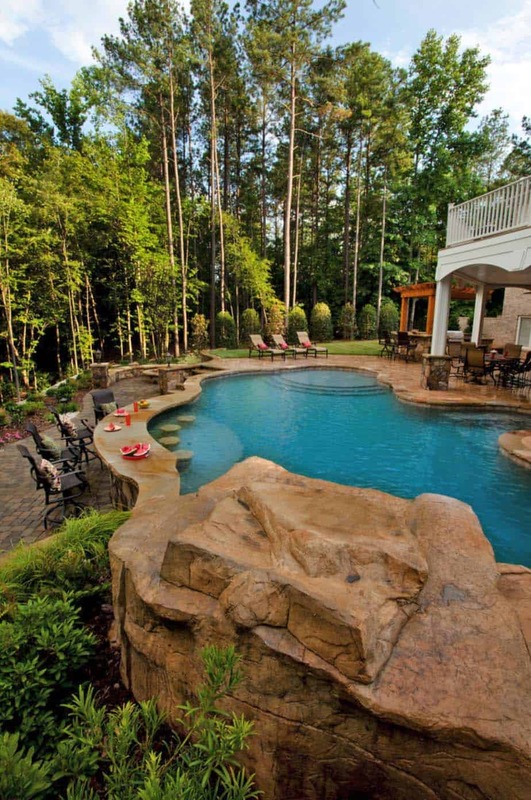 Impressive outdoor digs! 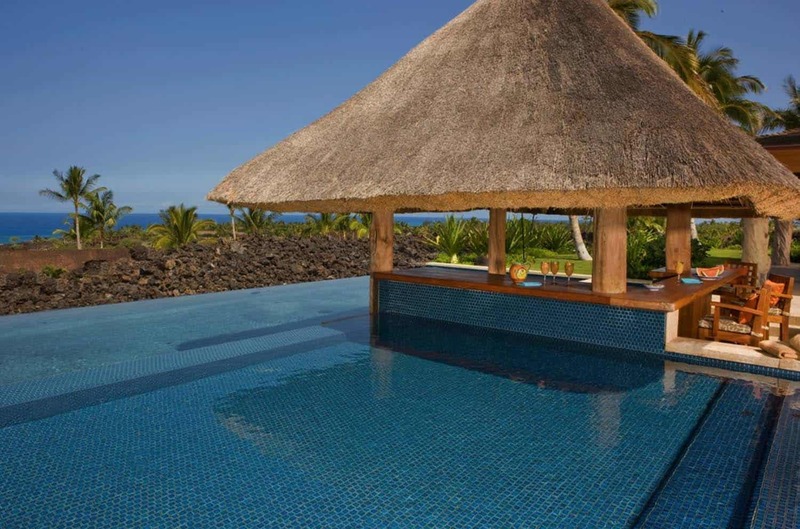 Above: This blue mosaic-tile swimming pool on the Kona Coast features a swim-up bar comprised of ohia wood, sheltered by a thatched roof. 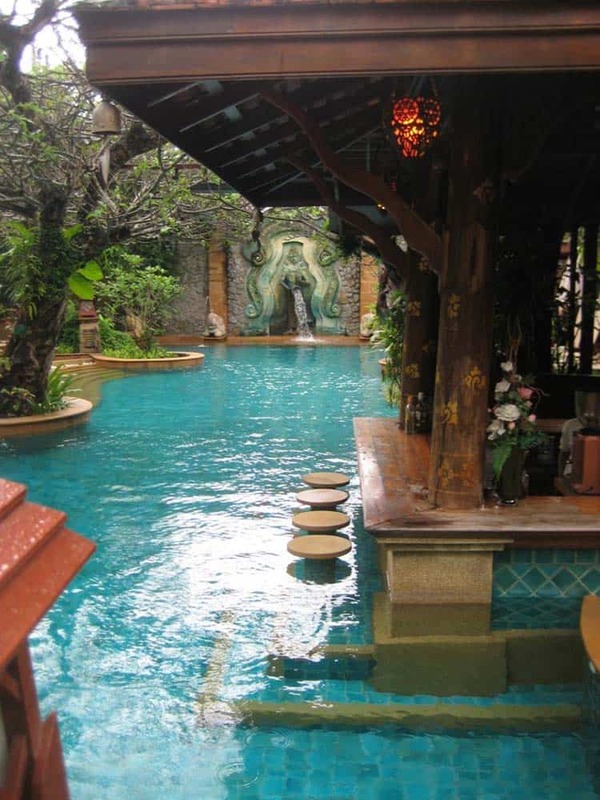 The property is surrounded by lava formations, adding to the tropical aesthetics of this outdoor oasis. 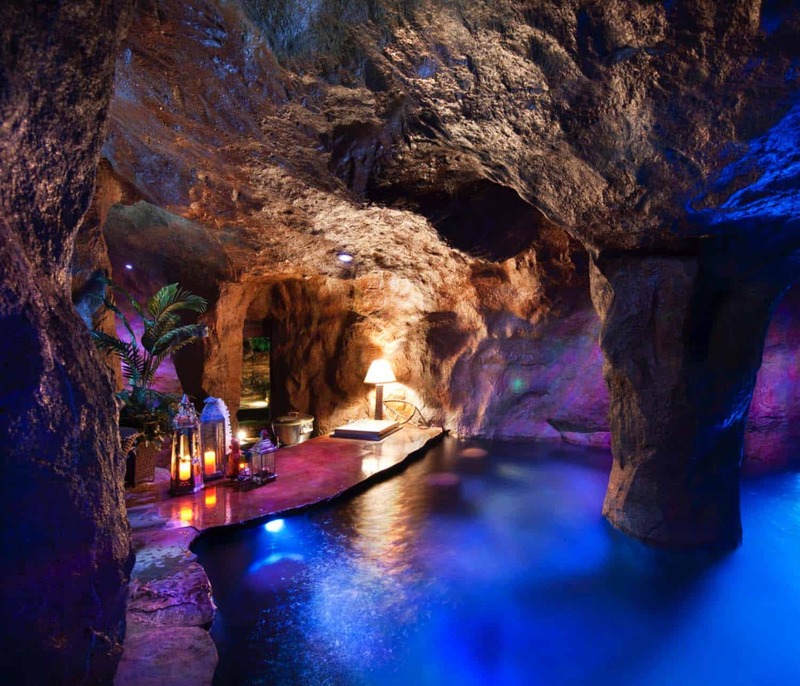 Above: The ultimate man cave, this swim through grotto features a swim-up bar and plenty of shade from the sun. 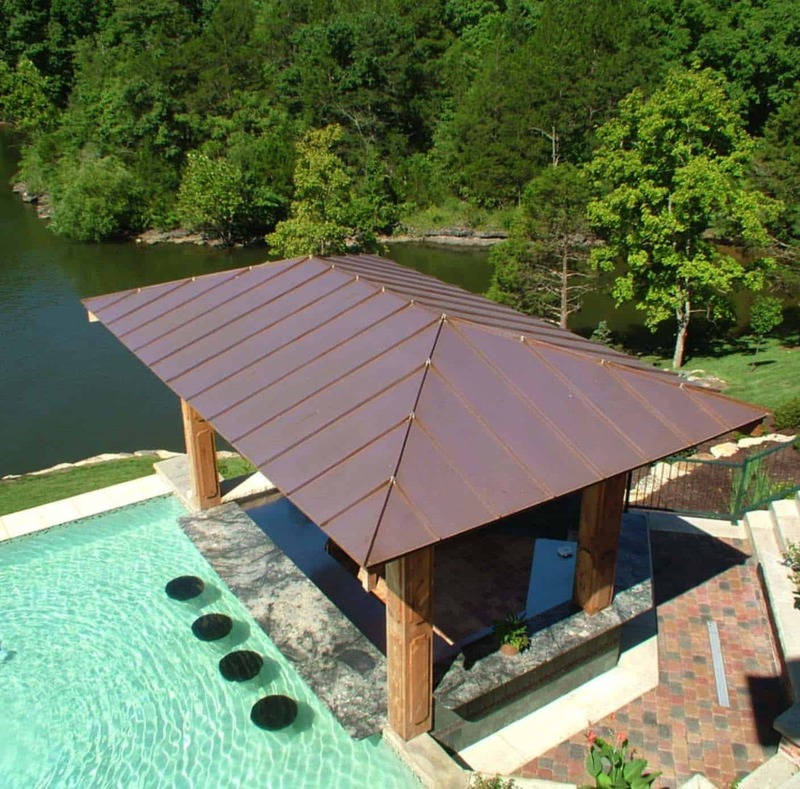 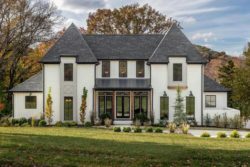 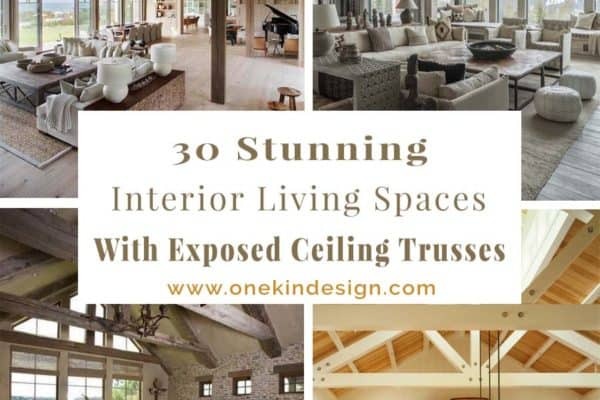 This project has received numerous awards, located in Oklahoma. 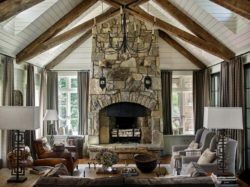 The interiors structure is comprised of native Oklahoma boulders. 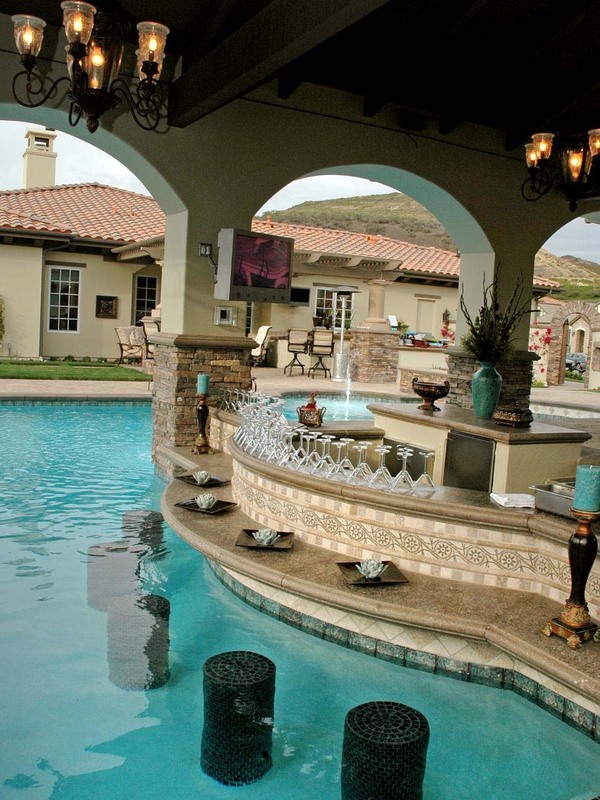 Above: A terraced patio brings guests to an outdoor sunken kitchen. 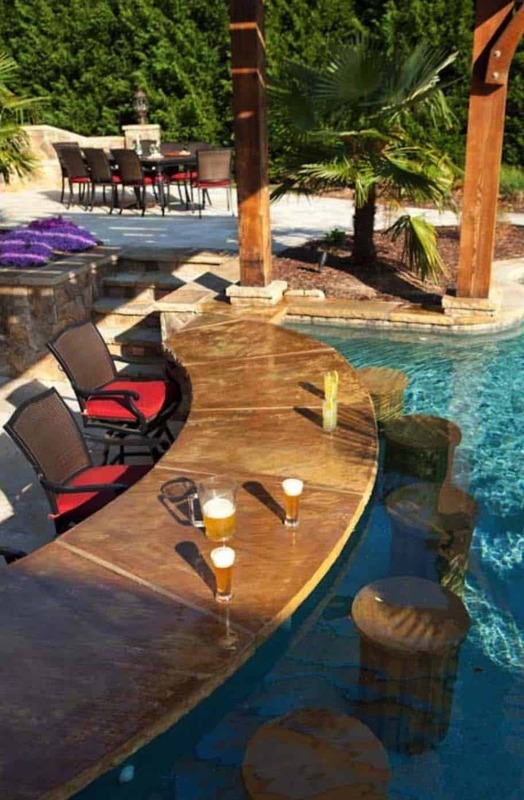 The countertop doubles as a swim-up bar, with seating for four. 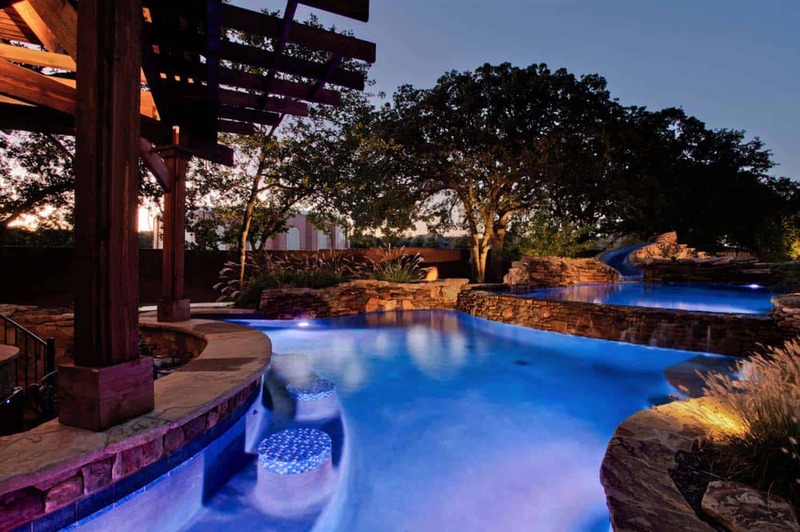 A built-in whirlpool completes this pool sanctuary, with an invisible edge offering sweeping views over a private cove.